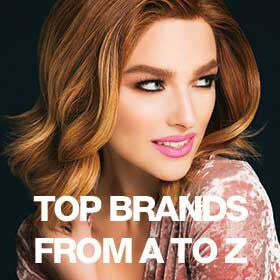 Our human hair wigs are some of the highest in quality and offer a natural looking style and soft feel. For this reason, many wig-lovers choose human hair wigs, which is why we offer a wide variety of new arrivals as well as classic styles for natural African American and Caucasian hair types. These varieties look and feel the most natural because they are made out of real human hair. Regardless of which type of human hair style you choose, be it lace wigs, remy hair, or one of our other options, there is nothing quite like the feel, weight, and movement of a high quality 100% human hair wig! Explore FAQs and browse human hair wig collections by all your favorite brands on All About Human Hair Wigs! Showing items 25-48 of 146.